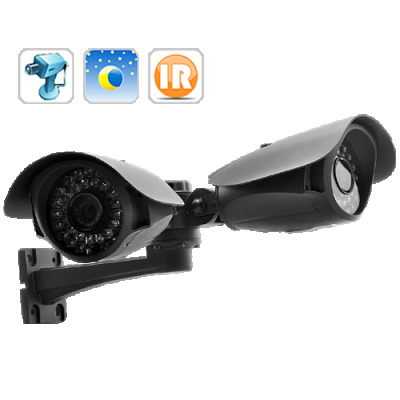 Successfully Added 2-in-1 Adjustable IR Surveillance Camera (PAL, Night Vision, 1/3 Sony CCD) to your Shopping Cart. Introducing the impeccable 2 in 1 Adjustable Surveillance IR Camera which comes with two heavily armored IR cameras to provide intensive surveillance for your property, day and night. This surveillance camera has two cameras mounted on one mounting bracket to make installation easier. Each camera is constructed with reinforced metal and utilizes advanced Sony 1/3 inch CCD sensor for sharper images. Each can be 180 degree horizontally and vertically adjusted to give you a full view of those sensitive areas of your executive home or business. With 36 IR LEDs, images captured at night are equally clear so even the sneakiest thieve in the dark won’t escape your watchful eye. It’s very easy to set up. Simply connect to the power cable, hook up with your monitor through the AV cable and you’ve installed two powerful cameras. You can even use it with a DVR to further expand its capability to display and record videos of both cameras simultaneously. With its indestructible build and advanced features, this is one security camera that never rests to protect your home or business. Offered at a fraction of the price if sold separately, this 2 in 1 surveillance camera is now available in stock for immediate shipment worldwide. Buy one for personal use, or purchase wholesale stock to sell and profit. Brought to you by your source for top quality surveillance equipment, Chinavasion. Use with a DVR to display and record two cameras simultaneously. This security camera is not wireless/cordless, you will need to connect cables from the camera to the computer, monitor or TV screen. Does the monitor display images from the two cameras at the same time?